While we were in Oz, we nipped up the East coast to Noosa to spend some quality time with my best girlfriend Jane and her hubby and their little boy. Jane and her crew were a bit delayed getting up there so Cakes and I had nothing to do other than wander up and down Hastings Street eating. Despite all the tasty available options and time on our hands, we kept coming back to one restaurant for breakfast. Because I LOOOOOVED their oatmeal. I normally couldn't give a toss for oatmeal, but this stuff got me hooked. It was nutty and chewy, not soupy & mushy like I had thought all oatmeal was. 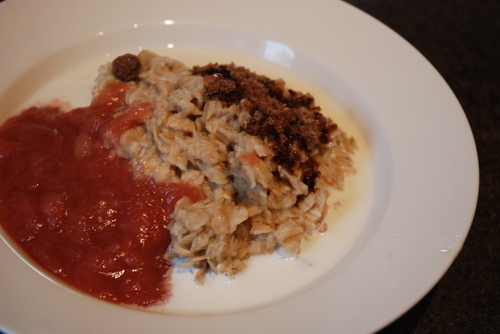 Plus it came with a generous topping of brown sugar, cream and stewed rhubarb. Since we've been back, I've made it at least twice a week. Make sure you use steel cut oats or thick rolled oats in order to achieve that nutty, chewy texture! In a medium saucepan over medium-high heat, bring milk and water to a boil. Add salt and steel cut oats and reduce heat to a simmer. Allow to cook for 10-12 minutes, stirring, until oats are cooked through, but still chewy. Stir in quick oats and remove from heat. While the oats are cooking, place rhubabr and sugar in a large microwave-safe bowl and nuke on high heat for 5 minutes. Remove from oven and stir. Nuke for 3 minutes more. Your rhubarb should now be a nice compote. If necessary, nuke a while longer. Divide oatmeal between two deep bowls. Top half of each bowl with rhubarb and the other half with brown sugar. Pour the cream around the edges of the oatmeal. For Silas' one-month birthday, Cakes and I went for a picnic in Hawrelak Park. It was a gorgeous day, Silas was very well behaved and we got to lie around on a blanket in the sun reading magazines. Never mind that the kitchen was a disaster zone and the laundry needed doing - there are some things far more important than keeping the house spotless. Along with our cherries and peaches (bought at a roadside stand) and bottles of iced water we took along a few slices of the goats cheese and roasted vegetable tart I made the day before. What had been delicate and fluffy (if somewhat, um, falling-apartish) the day before, warm out of the oven, was now much more flavourful and stood up to being eaten by hand - a cold velvetty, cheesy custard laced with garlic and paired with yummy roasted asparagus, capsicum and onions. You could definitely use zuchinni (I would have if there'd been any at the shops when I went) or mushrooms as well (I forgot to buy them). This tart looks nice, has plenty of veggies and milk in it and the pastry crust is thin so the damage in the butter department isn't too bad. You could probably cut the fat in the pastry down a bit more by substituting cream cheese for some of the butter, which I have been known to do from time to time, although I didn't here. Preheat oven to 200C (400F) Process flour, salt, pepper and butter in a food processor. 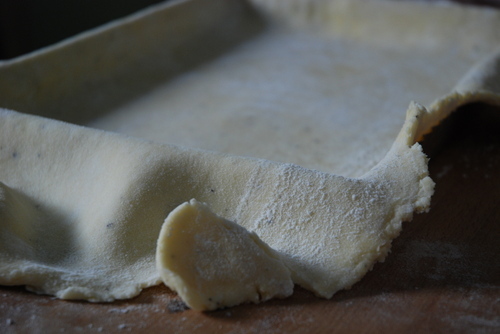 When it is mealy, blend in one egg and enough water (about 1-2 Tablespoons) to form a nice firm pastry dough. Roll dough out on a floured surface until it is no more than 2 millimetres thick. Use dough to line a 10-inch tart shell and prick the bottom of it with a fork. Set aside. Drain and pat the vegetables dry. Slice the onions and capsicum into thin strips. 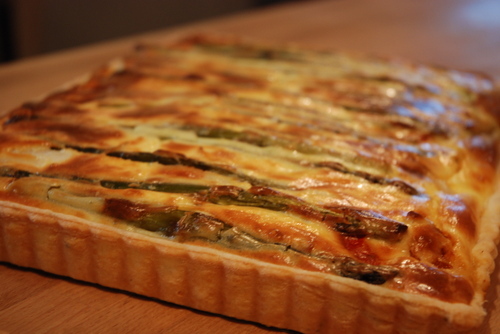 Arrange the asparagus, capsicum and onions in the bottom of the prepared tart shell. In a stand mixer, whip the chevre, goats cheese, eggs, yolks, salt and garlic until smooth. Add enough of the milk to make a pourable liquid about as thick as a syrup or pourable custard. Pour cheese mixture over vegetables and thump tart shell several times on the countertop to ensure it gets between the vegetables and down to the bottom of the crust. Bake in the oven for 20 minutes, reduce the heat to 180C (350F) and bake for 20 more minutes. Allow to stand for 15 minutes. You can eat this now, but the custard will be very delicate and will likely fall apart when eaten. It is better left until the next day in the fridge for the custard to firm up and the flavours to blend. Last October Cakes and I stayed at a great little B&B in Victoria. 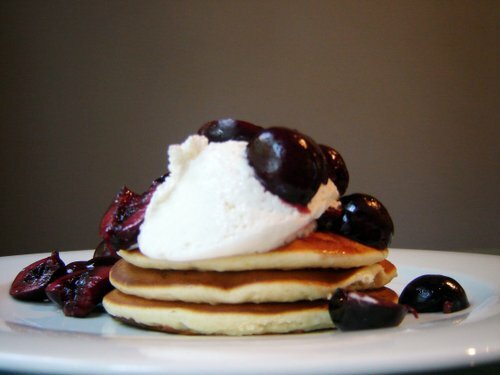 One of the items on the really fantastic breakfast menu was lemon ricotta pancakes. They were divine. Since the recipe I was promised by the proprietor of the B&B never materialized, I thought I'd make my own version. Although I do happen to have ricotta in the fridge, I felt like using cream cheese. So I did. These little pancakes are full of flavour and are sweet and spongy. I made them the size of the cross section of a largish orange, but you can make them what ever size you'd like. This recipe will make enough little pancakes for 3 or 4 people, depending on their appetites. Whiz the milk, lemon and creamcheese together on high speed in a good blender until smooth. Add the remaining ingredients and whiz until combined. Check the consistency of the batter - it should be just thin enough to pour easily from the jug into the frying pan, but not so thin it's runny. Add a little more milk, small potions at a time until the consistency is right. Pour little circles of batter into the frying pan. If you do circles the size of an orange or grapefruit, you can probably fit 3 or 4 in your pan at one time, making it easy to do one complete serving at a time. In our house people get to start eating their pancakes straight away and don't have to wait for others so that each person can experience them fresh and fluffy from the pan. Flip the pancakes over gently when the bottoms are nice and (darkish) golden and the uncooked batter on the top has become bubbly and stopped looking glossy. Cook for 30 or 60 seconds more and transfer to a plate. Top these lightly sweetened with whipped cream and cherries or raspberries. How many times have I posted a variation on poached eggs on grits? Not a hundred, but at least twice! I guess this makes post number three on the topic. And why have you not run off to buy your very own packet of grits as a result? There's no excuse. You know If I've posted about a thing more than once it's gotta be good, but 3 times now. Come on. Get off your duff. Get some grits. Besides. How easy is it to whip up some grits and poached eggs? Too easy. You can have breaky on the table in 15 minutes and because, at least in Canada, grits are trendy and happening, people will think you're a culinary star. Combine grits and water in saucepan. Add a bit of salt an pepper and a little dab of butter if you'd like. Bring to the boil, then cover and simmer over low heat for 5 -10 minutes, stirring occasionally until done. Turn heat off, cover and set aside. Poach eggs following these directions. Mix feta, dill and pepper together. Place a mound of grits on each plate. Top with a poached egg and top the whole thing with feta mixture. That's it. Cakes and I take our breakfasts pretty seriously. Every weekend we either go out for breakfast or cook something tasty ourselves. Because we cook probably 50 or 60 breakfasts a year, and are loathe to make the same thing over and over gain (though we sometimes do) we're always thinking about new and different breakfast recipes. This yummy french toast is a great way to use some standard breakfast ingredients in a not-so-standard way. 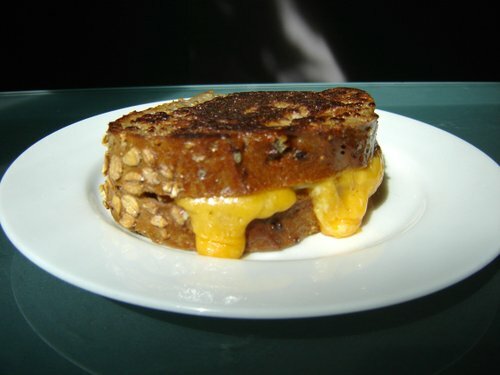 We stuffed our toast with a combination or medium cheddar (for optimum melty-ness) and grated asiago (for flavour), but there are unending cheese possibilities: Edam, Gouda, Havarti, provolone, piavo vecchia....You could also add in a few slices of crispy fried prosciutto or some spinach leaves. We would have if we'd had either on hand. Slice each double thick slice of bread through the middle, but not all the way through. leave the bottom crust (plus a few millimetres) as a hinge. Stuff cheese slices and whatever else you want in the middle. Beat eggs and milk together thoroughly with a bit of salt and pepper. Melt butter in frying pan over medium high heat. Soak stuffed bread slices in egg mixture, turning to make sure both sides are well soaked. Place each stuffed slice in the frying pan and fry for a few minutes, until browned on the bottom. Flip slices over carefully. Turn heat down to medium-low (2 or 3 on my stove) and cover tightly with a lid. Allow to cook, covered for 3 or 4 more minutes, until you can see cheese melting out of the middle. Turn over, and replace the lid. Cook 2 minutes more to ensure that the egg is cooked through and the cheese is all melted. "Oeuf!! !....now why'd ya have ta go and do that Mrs. Florentine?, all I said was you'd better be careful you don't go finding something out that you didn't really want to know. I thought you trusted me?" "Awww, Mr. Benedict. I know you had something to do with it. Or you know someone who does. Either way, you're guilty as hell and I intend to see that you pay." "That's an awful big fuss over a simple breakfast lady. What if things don't turn out the way you thought?" "Well, Mr. Benedict, that's a risk a girls's gotta take once in a while. Now hand me that knife!" "Mrs. Florentine! Stop! Please don't do this!" "Oh...It's just a poached egg in the middle." "I told you you'd be disappointed darlin." That's it for the very brief film noir portion of this months EotMeoTE entry. As you can see, work's run me ragged and my brain just can't cope with any sort of task requiring thought. Forgive me my feeble effort. The breakfast was good though. Cakes and I eat poached eggs on cheesy grits for an awful lot of our weekend breakfasts. I'd have to say it's probably our favourite easy, Saturday breakfast food. We love it enough that variations on it have appeared on Lex Culinaria at least two times. This weekend, hot off last week's runaway popular beehive pasta timballe, I decided to try a smaller version for breakfast, using grits. It turned out brilliantly, other than the fact that I think I cooked it a touch too long so the yolk was not as runny as I would have liked. This entry is also special as it is the first time in a long long time that my weekend breakfast-making schedule has coincided with the end of the month and therefore I have a post for the End of the Month Eggs on Toast Extravaganza. EotMEoTE is the only (cooking) meme I know of that started out as a piss-take of memes. I invoke the longstanding EotMEoTE rule that any carbohydrate, in this case grits, can stand in for the "toast". If you had pre-cooked the grits the nigh before, or if you has leftovers, this would be a snap to make for a special brunch or breakfast. Butter the inside of two oven proof glass or ceramic dishes (each about 350-400 ml). Mix salt, pepper and cheese into grits. Divde grits into thirds. Press 1/3 into each greased dish, to cover bottom and sides. leave 1/2 inch (1cm) room at the top of the sides. Crack one whole egg into each grit-lined cavity. Top with chives, crumbled bacon, more cheese, whatever you want. Divide remaining grits in half. Roll each half into a ball and use a damp rolling pin or your hands to flatten the ball into a circle that will cover the top of the egg and grits in the dish. Top each dish with a round of grits. Press gently aroung the egdes to seal. Bake dishes in a 350F oven for 15-20 minutes. After about ten minutes start checking every few minutes to see if the egs are set. Remove them from the oven when set. Run a knife around the inside of the dish to loosen and then invert onto plate. A quick squiz at my circa 1995 Secrets of Fat Free Cooking book reminded me of the fact that I used to do a lot of my baking using pureed prunes, especially in recipes using chocolate or oatmeal, as a substitute for some of the fat and sugar. There is something very synergistic about prunes and baking. One of my absolute favourite tarts in the world is a semi-sweet chocolate and prune tart - heaven! Given my culinary direction at the moment - healthier than the last year or so - I thought a nice fruit and nut breakfast bread might be in order. I made a big loaf, and cut it into thickish slices and froze them individually in baggies. I (or Cakes) can pop them out of the freezer and into the toaster in the morning. That is if they last that long! One of the really great aspects of this recipe is the toasted nuts. Toasting nuts before you use them in baking really allows their flavour to amplify into something much bigger than it would be minus the toasting. You can get away with relatively fewer nuts this way without sacrificing any of the flavour, and, if you're counting calories, that's always a good thing. I also briefly toast my wholemeal flour in a dry stir fry pan - it develops a lovely nutty flavour that really enhances the taste of this bread. The bread is slightly sweet and very nutty and fruity tasting. One small slice is plenty for breakfast! Thos recipe's adapted from one appearing in Secrets of Fat-Free Cooking by Sandra Woodruff. Combine oats, milk and vanilla and set aside to soak for 10-15 minutes. Place prunes in a food processor and turn on. While processing dribble the water in slowly and process until you have a smoothish paste. If the prune skins still form specks in the paste, that's fine. Combine flour, sugar and baking powder in mixing bowl and stir until combined and there are no large lumps of brown sugar remaining. Mix in oatmeal and milk mixture and process a minute or two to blend well. Stir through nuts and fruit. Pour into a non-stick loaf pan and bake in the centre of your oven at 325 for 35-40 minutes, or until a pick inserted in the centre comes out clean. Allow to cool in the pan for 5-10 minutes and then turn out onto a rack. Allow to cool for a further 20 minutes before slicing. Per slice: 202 cal, 3.3 grams fat, 5.2 grams fibre, 3.5 points. Every odd weekend, Cakes and I attempt to get up early enough to get ourselves an Egg McMuffin. I know. Don't even say it. I am what I am. Luckily for us, we very nearly never make it up and out the door on time. Which leaves us to our own devices in the arena of the breakfast sandwich. This weekend we hit upon a great, grown up version of the McMuffin. All courtesy of an impromptu shop-up at the local German deli that is a mere block and a half away from my house. All I had intended to get when I walked through the deli doors was a jar of amazing pickled green beans that I've never seen anywhere else. What I ended up with was three jars of the beans, a block of pistachio halva, a coconut-middle Ritter Sport, a block aged cheddar cheese, and a beautiful smoked turkey thigh. I really oughtn't to be allowed in a store like that unsupervised. Not if we want to have any retirement savings or be able to see our waistlines into next year. It was the smoked turkey thigh that made the Mega McMuffin possible, that and the fresh whole wheat English muffins I'd also picked up. Picture it: toasted, soft whole wheat English muffins, topped with thick slices of aged cheddar cheese, smoked turkey and free range double-yolk eggs. I reckon we've eaten our last Maccas version. Now I'm off to try to duplicate my mum's famous smoked turkey, onion and potato soup. Seriously good stuff. You really should try some smoked turkey next time you've got a recipe you'd normally use bacon or ham in. The smoked turkey is juicy, and the meat velvety, in a way that ham never is. I love eggs Florentine. Unfortunately, in our house, we are wallowing thoroughly in post Christmas guilt and therefore hollandaise sauce is not exactly welcome. Poached eggs definitely are though. And there's always room on the plate for a sprinkling of beautiful reggiano. In honour of this past year's favourite comfort food, I've reworked the beloved eggs Florentine into something much more healthy and every bit as good. For this recipe I used quick grits, which are quite fine - with grains about the same size as cream of wheat. You can get much coarser grits, which work just as well and have a more interesting texture, but they take much longer to cook, and on a Saturday morning, when I'm feeling lazy, I just don't want to spend 45 minutes in the kitchen nursing a pot of coarse grits along. Grits cook and set up a lot like polenta, which I suppose is not that earth shattering a revelation, as they are both made from ground dried corn. Because, like polenta, grits tend to set up a bit once they start to cool, it's best to time things so that the grits don't sit for more than a few minutes after they've been cooked before serving. The few minutes sitting time allows them to set up just enough so you can make a nice big mound out of them, without them being too firm. Place grits, water, salt, pepper cheese and spinach in a 5 litre Pyrex casserole with a lid. Cover an microwave on high for 4 minutes. Stir, and microwave for 2 more minutes. Poach your eggs according to these instructions. I promise they'll be perfect. Divide the grits into 4 portions and make little mounds out of them on four plates. 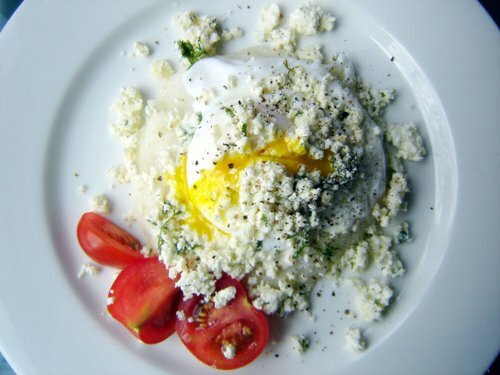 Top each mound with a poached egg and sprinkle over some more fresh ground pepper and a bit more reggiano. There's no reason to feel guilty about this breakfast. Unless you can't stop yourself from having seconds. Yay Paper Chef! You've done it once again. You've caused me to step outside my comfort zone and try something new, which (I am very happy to say) was a resounding success. Quinoa will henceforth be a new staple in our house. For those of you who have no idea what Paper Chef is all about, let me explain very briefly. Owen Linderholm, of Tomatilla, thought it would be a great idea to do a blog-based version of (sort of) Iron Chef. Once a month, on a Friday, Owen draws four random ingredients out of his magic chef's hat. The food blogging community then has until noon on Monday to come up with their own interpretation of the ingredients. Sometimes the ingredients are pretty easy to make into something. Other times they are a bit more challenging. What never fails to amaze me though, is the very different concoctions Paper Chef participants come up with. You'll never see the same thing twice, and you'll certainly see a whole lot of things that astound you. You'll also likely think, "why didn't I think of that?" The thing I like most about Paper chef is that it makes me try new ingredients, or new ways of thinking about familiar ingredients, that I wouldn't otherwise try. I think the once monthly kick in the pants to trey something new makes me a better cook. This month Paper Chef is being hosted by Belly Timber, so get on over there and check out the roundup of entries! Now, the quandary. What to do with this months 4 ingredients? Quinoa, yogurt, cashews and "baby" (as in small not gerbers) food? Before I tell you what I did, a word about Labanya. For those of you that have been reading Lex Culinaria since the beginning will now that labanya's nothing new in our house. It's a Middle Eastern soft cheese made from hung yogurt. Depending on the yogurt you use, it can be very mild and tastes like a cross between goats cheese (with a slight acid note) and cream cheese. It has a texture very similar to soft cream cheese. In our house we spread it on toasted bagels instead of cream cheese. For the Labanya: Line a 2 litre mixing bowl with cheesecloth. Empty the whole 1 Litre of yogurt into the middle of the cheesecloth. Gather up the ends and sides of the cloth and twist until cloth is just taut over yogurt. Tie yogurt filled cloth so that it is suspended over your counter (I tie mine to the knob of the upper cupboard). Place the 2 litre bowl underneath to catch drips. Leave yogurt suspended overnight, up to 15 hours. After 12-15 hours, the yogurt should be reduced in volume by at least half. Untie bag and place stiff ball of cheese into a small mixing bowl. Stir in salt and pepper to taste. Set aside. This is what your labanya should look like when you unwrap it! To roast the beets: Wrap beets in foil. Roast in a 425F oven for one hour. Allow to cool until you can handle them easily. Unwrap the beets and use your fingers to rub the skins off. Do this under cool running water, or you'll never get the pink out of your skin! Pat beets dry with paper towel. Slice beets very thinly. Set aside. To cook the quinoa: rinse 2/3 cup of quinoa under cold running water in a fine mesh sieve. Place in small saucepan with a pinch or two of salt and 1 litre of water. Bring to a boil, reduce heat and simmer for 20 minutes. Drain cooked quinoa in sieve. Saute minced garlic cloves in butter over medium heat, when garlic is golden, add cooked, drained quinoa. Cook and stir for 3 minutes to evaporate any excess water from the quinoa. remove from heat, add salt and pepper, chopped parsley and all but 1 Tablespoon of the cashew nuts. Gently stir through 1 heaping tablespoon of labanya. Set aside. To make the dressing: combine lemon juice, garlic, oil and egg in a small, tall sided container. Whip with an immersion blender until well blended and slightly frothy. Season with salt and pepper. If you don't have an immersion blended with a whip attachment, you could blend it on high in a jug-style blender. To assemble: grease the inside of a biscuit cutter, or large round cookie cutter. Place greased cutter on plate. Layer several slices of beet inside cutter on plate, making sure the beet slices overlap so that the bottom of the circle is completely covered. dollop 1/4 cup of the labanya on top of the beet layer. Use the wetted back of a tablespoon to smooth the labanya layer out evenly to the edges of the ring. Fill the ring loosely to the top with the quinoa mixture. Press down gently on the quinoa with the back of a wetted spoon to compress. Cover the quinoa layer with another layer of overlapping beets. Press down to compress. While pressing gently on the top layer of beets, gently slide the biscuit ring up and off. Scatter some baby greens over the top of the salad stack and sprinkle with a pinch of the reserved cashews. Drizzle dressing over. I know there's a lot of prep work involved here, but it's not really labour intensive prep work at all. It's just waiting time. You could easily roast the beets, prepare the quinoa mixture and dressing while your yogurt is hanging. If you did this all the day before, you could assemble all four salads in 10 or 15 minutes. This dish covers the entire taste and texture range and does it beautifully. The sweet and earthy beets, tangy garlicky dressing, springy quinoa and creamy labanya - Cakes kept asking if he could have another. This is definitely a keeper. Now if only I could figure out how to stop the beet juice from bleeding into the labanya!